Sorry for the couple of weeks without update! Been in heavy development mode, and some other things got in the way. But back on track! Managing has never been this easy! Now with a sleeker design, and better overview and division of the different aspects of your resort’s finances. 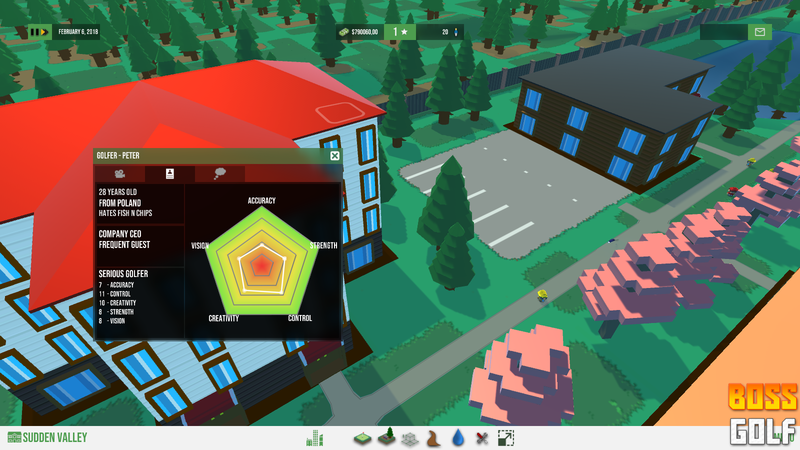 All updated on real time, with graphs wherever they are needed, and easier access to the costs of your employees to give you more information when you need to fire them. Golfer panels have also been updated and received the new UI makeover! He’s not a very good golfer for a CEO. The needs feature is also getting a revamp for the next update, adding more data regarding the golfers’ likes and dislikes and feedback for your course. For the rest of the stuff, it’s difficult to show photos since it’s a lot of internal working. So I’ll list the new stuff in here! Roofs are in for your buildings! Three types for now, with a more simplified display. But adds tons of flavor to the buildings! Added more pieces to use on your buildings. They affect the maintenance costs. Fixed issue with Builders trying to build a building while you are still planning them. Fixed decorations not being placeable. Adjusted the physics for the golf gameplay. The ball should act more “realistically” to different terrain types (hurrai physics materials!) and the forces acted upon it for shooting it have been tweaked. Now the loft of each club is used properly. Fixed AI calculations for putting shots. Now they’re taking into account the height difference between the ball and the pin. Buildings will now properly block the navmesh after being built. Character panels now properly reflect the current state of the AI (Idling, moving to lay tiles, waiting etc). Updated text on the game to use TextMeshPro, for much, much, much better readability and resolution. It’s night and day compared to before! Decoration pieces now modify the navmesh properly! AI sometimes got stuck when navigating them, but now they resolve it correctly. Fixed pathfinding to only try and reach the target position if it’s reachable; otherwise just go as far as the path allows. In instances when the target position is necessary (to strike the ball, for example), it will still reach it. Fixed the Landscapers not wanting to do any work when loading a saved game. Gabled, Flat, Angled… You can take your pick! We’re getting closer to a feature complete version of the Early Access build. Working on updating the panels for the decorations and the water, probably unifying them into one unique panel. Same will follow the paths later! New Main Menu in 0.66! Update 0.66 is out for the closed alpha, including a brand new main menu! So there you go! More freedom to play the game your way, and getting closer to Early Access features! Oh, and there may be a pretty big announcement for the end of this month! So stay tuned! 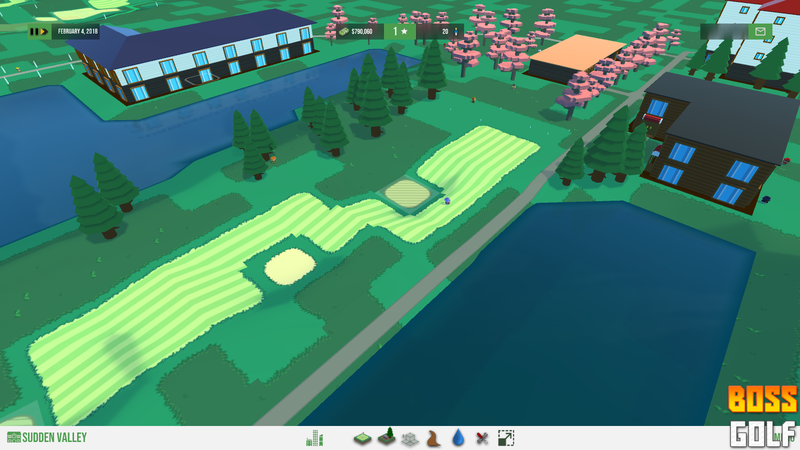 Work has been progressing awesomely for Boss Golf 0.6! I’ve finished implementing the firing feature, as well as saving the people you hire. Optimized the system again so that it only instantiates the workers when necessary, and keeps a list of StaffData objects that contains the descriptors for each worker. So now the game starts with 100 Landscapers in the pool, and a handful of them being available for hiring every month! I could release the current state of the game as is, but… I’ve taken a step forward, and began overhauling the Financial features too! Look at all those graphs and charts! At a glance, from the summary, you’ll be able to see right away the overall picture of the financial health of your resort. You have the Overall Balance at the top, followed by the Profit/Loss on a monthly basis, then snapshots of your biggest sources of Income and of Expenditure, as well as your Approval Rate (a new feature that will be fully implemented later! Together with special requests to the owners of the resort you are managing!). Then you also have sections for Income and Expenses and Salary, which will give you more detailed information about these aspects of your golf resort, breaking down the financials to more fine grained chunks. And lastly a Prices panel, where you’ll be able to set the various prices of things on your resort, as well as information on purchase rates and whatnot. 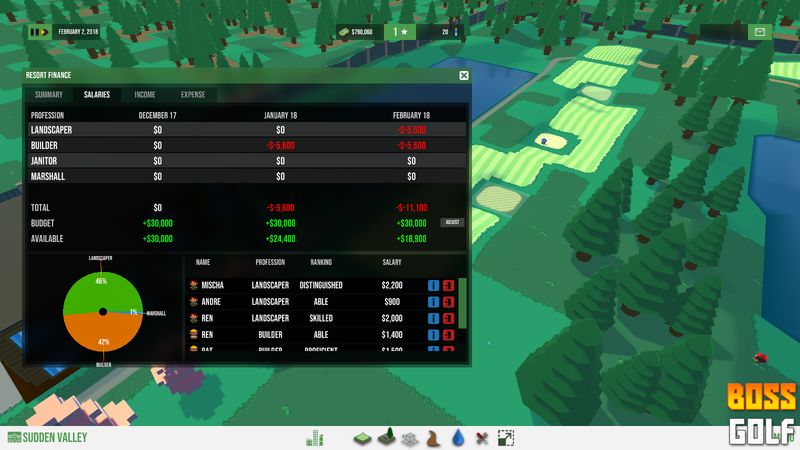 This is still not the final version of the Financial System for Boss Golf, but it is a massive leap forward compared to what we have now! Once I finish this implementation, 0.6 will be ready for testing!